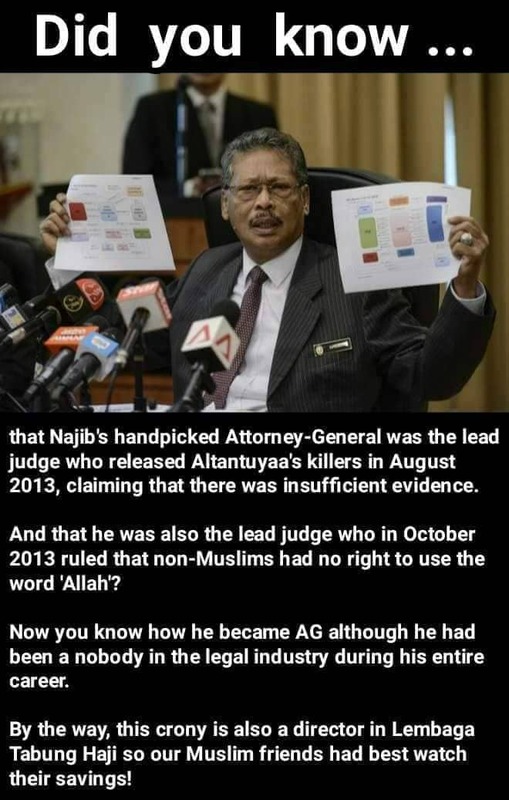 Straits Times : Malaysia's Old Attorney-General, Tan Sri Mohamed Apandi Ali, is a former Federal Court judge who had presided over several high-profile cases, including the murder of Mongolian translator Altantuya Shaariibuu and the prohibition of the use of the word "Allah" for non-Muslims. Tan Sri Mohamed, 65, chaired the Court of Appeal which overturned a High Court's decision to convict former police commandos, Azilah Hadri and Sirul Azhar Umar, of the murder of Ms Altantuya. She was killed in 2006 in a high-profile case linked to a submarine deal involving a former Najib aide when the latter was Defence Minister. The remains of Ms Altantuya, who was involved in negotiations for the submarines, were found in a jungle clearing near Kuala Lumpur after she was apparently shot and her body blown up with explosives.